Rated 5 out of 5 by RachelT from Favorite part of the remodel This pot filler was purchased for a historic homes custom kitchen remodel. It's absolutely stunning in champagne bronze and is the homeowners favorite feature! If you have been on the fence about a pot filler, do not hesitate! This product is well worth it and will add a stunning touch to your kitchen. Rated 5 out of 5 by rdesigns from Stunning Bought this and the pictures just don't do it justice. Love the champagne finish! They match my amerock pulls/knobs and my sconces perfectly. Rated 5 out of 5 by wayne1997 from This product is very useful when it comes to filling large pots without leaving the range top area. The faucet provides a lot of usefulness in the kitchen area. The only draw back to the product is when it is folded against the wall you have to be careful how far you push it back as I have hit the tile back splash on several occasions and thinking I had cracked the back splash. I put a rubber piece on the top part to keep it from hitting the wall. Rated 1 out of 5 by Jim2017 from Valve leaks after lesss than 10 uses I had my kitchen remodeled and was excited to have a pot filler. The ceramic valve cartridge nearest the wall leaked within 6 months (and only after 8 to 10 uses). The on-line parts list doesn't have the ceramic cartridge part number. So, I am stuck with a dripping pot filler or shut the water off completely until I figure out the cartridge part number. Rated 4 out of 5 by Rob from Great looking product I bought this a few weeks ago. I have not installed yet but packing was great and product looks nice. Rated 5 out of 5 by LT from Great pot filler Bought the pot filler about a month ago, it is very well made as you'd expect from Delta. Installation was very easy and so far we are extremely pleased with it. 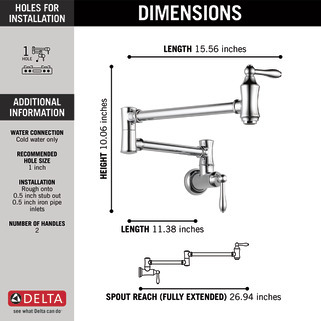 Rated 4 out of 5 by GGGoodnuff from Looks great, overall good performance, excellent support from Delta I recently purchased and installed the Delta Traditional Wall Mounted Pot Filler Faucet. It's look really complements the overall modern/classic look of our kitchen. Build quality and the Venetian Bronze finish are excellent. Functionality is as expected, with plenty of reach to fill pots at any location on our 30" stove top. One minor problem is that the valve at the mounting point on the faucet does not completely shut off the flow of water. Thankfully there are two valves. I contacted Delta customer support and they have shipped a new valve under warranty. Hopefully that will remedy the problem. Rated 5 out of 5 by Charl08 from Beautiful Pot Filler! This pot filler was a perfect addition to our kitchen remodeled. I am so happy we chose to add it in. Very high quality. Rated 5 out of 5 by Pete from Great looking, smooth operation, love it! I installed this faucet as part of a kitchen backsplash remodel that I completed myself. I found the installation instructions easy to understand. The installation went well and my wife and I love it. We also like the design and function. The mounting is secure which allows the swivel arms to move smoothly with out any wiggle up and down which is something I was worried about. The faucet looks great on the wall and has the reach to fill pots on all out burners. The feel is solid when you are turning the water on and off. The faucet also has double valves, meaning both handles can control the flow of water and both shutoff the water off so you have backup protection since there is not a drain below this type of faucet. 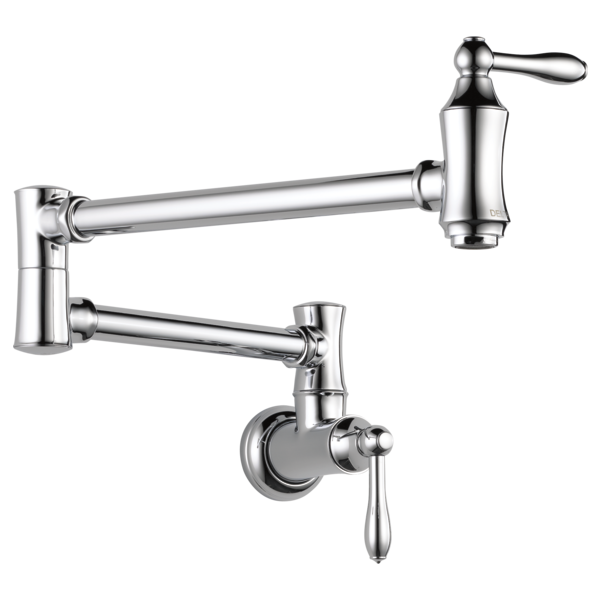 Overall this is a great faucet both in quality and value. I would highly recommend this product. We like it so much we are looking for a Delta kitchen sink faucet to match. Lastly, not really realted to the faucet, but if you are doing the work yourself buy the crimping tool and use the PEX pipe. Once you use PEX you will never sweat a pipe copper again. Rated 5 out of 5 by Flora from Clean and beautiful Bought this for a customer. Beautiful color and clean lines but Delta never looses its integrity on its products. We loved. it! Rated 5 out of 5 by Hgwino from This piece was the last piece that made the kitchen look gourmet! 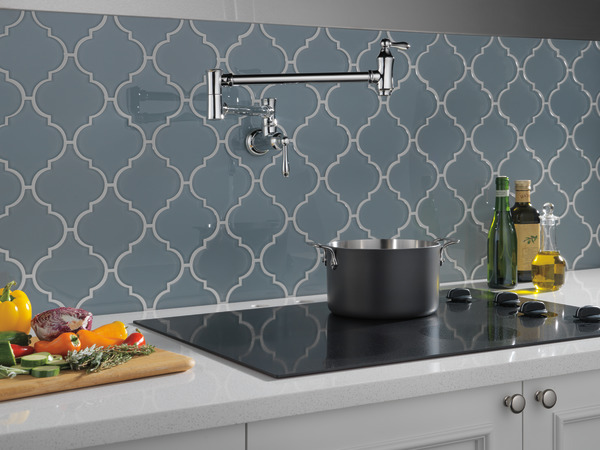 The faucet set against subway tiles looks sharp and completes the stove. Its very sturdy and the stream of water is perfect. No splashing. I would recommend this all day long. Rated 5 out of 5 by first from Great look and Functionality! We recently installed this on our job. It has a great look and functionality. Our customer is very pleased. Rated 5 out of 5 by Merrick from Great water flow and very easy installation, only took a few minutes. We bought this for a new home we are building and the client was very happy with the look. The filler has a dual swing so that it can reach every burner. Very well made! Rated 5 out of 5 by Jody from Delta Pot Filler I am a custom builder and this is the 2nd delta pot filler that I have installed. Since the 1st faucet was exceptional I installed a 2nd one in the next home I built. Rated 5 out of 5 by Tara from Looks great! Matches all my other faucets I bought this for my new home kitchen. Used it and it's amazing. It shines and makes my kitchen look even better. Rated 5 out of 5 by Boot95 from Pot Filler This is exactly what I was looking for in a pot filler. Great prpoduct! Rated 5 out of 5 by Metalinda from Awesome look and functional I purchased this faucet for my kitchen remodel and it works and looks great in my kitchen! Wonderful choice the satin nickel blends well with stainless appliances. Rated 5 out of 5 by Happy Customer from Beautiful addition to the kitchen We purchased this in the artic finish, along with matching kitchen faucet. This is a very well made, quality product and build.com offers it a great price. I would recommend this to anyone wanting a rich, traditional looking piece of hardware. Great compliment to our newly remodeled kitchen. Can't wait to use it. Rated 5 out of 5 by Greg from Looks Great! I must admit that I haven't installed the unit yet, but I have received it and taken it out of the box to make sure I was happy.. and boy was I! I really like the look and feel, it also matches the Cassidy faucet I got, so I can't wait to see it all come together! Rated 5 out of 5 by BridgettMM from Classic & Functional I purchased this pot filler for new construction and it is absolutely beautiful and so functional. I love the ease of use and the polished nickel finish is so timeless. I never venture far from delta fixtures because of the quality and service that delta provides, so I know this piece will be great in year to come, as well. Rated 5 out of 5 by Gloriaj0 from Looks great. Plumber liked th product We purchased this pot filler with matching Delta touch faucets for the high end addition remodel we are doing for a client. The client considered using the Brizio but the Delta color finish was closer to the look her designer and she wanted. Plus Delta seemed to offer a better value for the investment. The plumber roughed in the pot filler easily and the fixture is installed. It looks great. The homeowner has still not decided on her countertop material so plumber has not been back for finish plumbing. But the product looks expensive and the artic finish is a great color. Rated 5 out of 5 by Jsandie from Looks beautiful! We bought this to go with the other bronze fixtures for our kitchen remodel, and we couldn't be happier. The finish is beautiful, and it works perfectly. The finish is slightly different than other brands, but completely unnoticeable once everything is installed. Rated 5 out of 5 by Ryan from Great Pot Filler This is a great pot filler. It was easy to work with the specs and actual install. I would definitely use this product again. Superior. Rated 2 out of 5 by Rn583764 from Only looks good I am disappointed that I am already experiencing problems with the dual shut off valve. I only had this pot filler faucet installed about 8 weeks ago and the shut off valve on the wall is no longer working appropriately. I was expecting better quality for a faucet that costs over $420. Rated 1 out of 5 by Michelle from Very Disappointed We built our new home and I knew I wanted a pot filler. I selected Delta Faucets because of my positive experience with Delta in my other home. I did my homework and intentionally selected a pot filler with double valve for safety measure to reduce leaks. I met with my plumber and he ordered the this pot filler. It looked great and I was proud of my new kitchen as we moved in April 2016. It is now September 2016 and the second valve (next to wall) is not shutting water off. I have used the pot filler less than 10 times so this is very disappointing this faucet does not last longer than a few months and after minimal use. Rated 5 out of 5 by Linda from Love Our Pot Filler We love our pot filler. 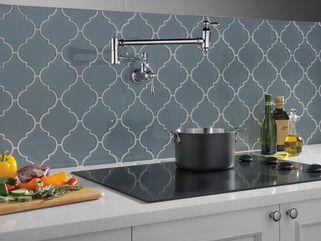 We use it all the time and it goes nicely with our Delta Cassidy faucet. We have not had any issues so far. Works and looks beautiful. We purchased this Delta pot filler last October for our kitchen remodel. We did a lot of research on brands to use and were surprised how expensive pot fillers are. We finally read that Delta was one of the best companies to use for faucets and had it installed. I have installed this pot filler slightly right of the cook top so it is centered a little better when folded. When folded the top valve (closest to where the water is dispensed) points directly at the back wall when folded if it is in the &quot;closed&quot; position. This means that if I fold the pot filler back and leave it in the closed position the end would hit my wall. Can this be changed so the valve points forward instead of backward? Also, I though it was odd that a clockwise turn caused the water to turn on instead of off, like most faucets. Can this be changed/adjusted? 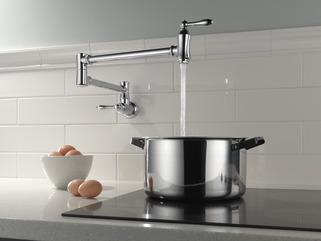 Does this pot filler fit stylistically with any other faucets in the kitchen collection? When mounting this pot filler over the stove do you mount it centre or off centre in order for it to look centered when it sits against the wall? Is it possible to install this upside down? I want the supply pipe at the top and the spigot on the bottom. pot filler leaks at the center pivot. how do I repair ?